I've been spending some time lately weaving. Nothing overly major at the moment, just some simple back and forth action with beautiful yarn that is deciding on how the fabric should be patterned. I haven't really been knitting too much, and the knitting that I have done isn't at all noteworthy. So I'm all about the weaving lately. Which has been making Brett über happy, since he was the one that bought me the loom and when I first got it I was all about the loom for the first few months. Then it sat in my sewing closet for almost a year. A huge reason why I'm back at it is cause weaving isn't demanding on the hands. I have no idea what this is going to become. Definitely not a scarf, that's for sure. I'm thinking of using it as actual fabric. I guess we'll have to see what it wants to be once I'm finished the weaving part. 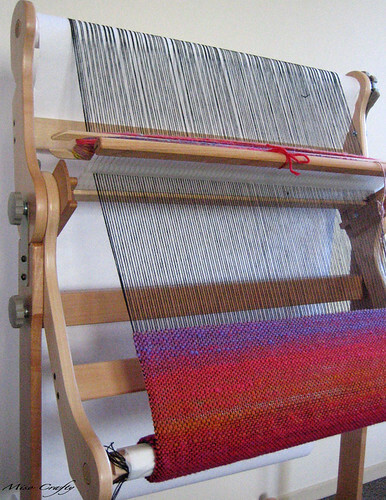 In the meantime I've become inspired and have some weaving experiments that I want to try out. More on that when I get to it. For now, I'm going to make some tea and do some soothing weaving! jealous of your loom... just saying!